Does anyone actually keep score anymore? The first person you encounter inside the ballpark is almost always some individual behind a kiosk of some sort selling programs, scorecards and $1 pencils. There’s never a line at these stations in my experience. Typically, they only serve to split the flow of pedestrian traffic in two. Some go left, some go right, and a very small percentage actually stop to pay for the utensils necessary to keep score. 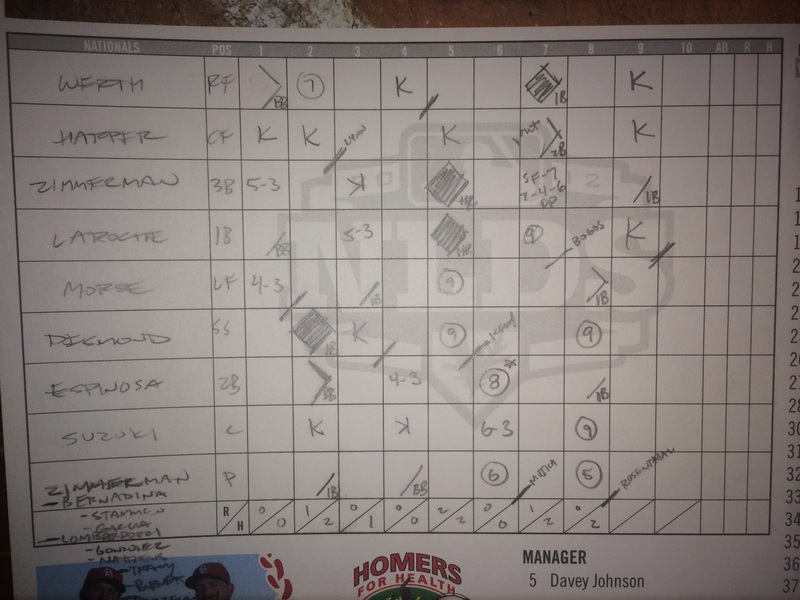 Jim Caple at ESPN wrote an awesome piece this past fall about the art of scorekeeping. He argues that this practice has slowly gone by the wayside and very few individuals take the time to follow every play and document it themselves. Is it the rise of technology that has led to this decline? Of course, I can just hop on my phone and scroll through an entire game in a heartbeat. At my fingertips, I can recall the entire play-by-play…whether I watched the game or not. But that’s not the point of scorekeeping, really. Keeping score is a personal art form. Whenever I pick up a scorecard and pencil – which, admittedly, I only do about 50% of the time I go to the park – I find myself very stingy about who can mark in my scorecard. I’m not going to get up mid-inning and allow whoever is sitting next to me to keep track for me. It’s not the same. The marks will look different. There are a million ways to keep score, and there’s no telling if they’ll do it the way I do it. It has to look consistent and it has to look good. Artists don’t randomly hand over their easels for someone else to paint on while they go to the bathroom. And writers don’t let someone else fill in for a paragraph while they go grab a corndog. Maybe those are exaggerations, but the value is the same. Scorekeeping is an extension of the self in a new form. The handwriting of the player names on the left side has to be impeccable – at minimum it has to look consistent – and God forbid you ever have to break out the eraser and mar the whole program. Might as well go buy a new one and start from scratch. There’s pressure to make it look nice. It’s a work of art. A sketchbook. At minimum it should be crisp, clean and legible: decipherable at a single glance. At least, that’s how I like it to look. Perhaps others are less meticulous about their scorecards, but I suspect mine is a pretty common tale. Besides, what if something great happens while you’re off taking a leak? What if I miss something? I have to be able to draw a little asterisk or draw an arrow with a short note in the margin – I can’t leave that up to someone else. That’s my work of art and I’m the one recording the memories. Sure I can look at a play-by-play on my phone or computer and remember what happened. But there’s no way of remembering how mad you were when your guy slapped into an inning-ending 6-4-3 double play, or how ecstatic you were when your opponent struck out looking with the bases juiced. These things you can read in the subtleties of the scorecard. Sometimes it’s found in the amount of pressure you drew the line to signify the end of the inning. Or maybe it’s more obvious – you could include a small “!” as a way of marking the moment. But it’s not simply about seeing the details of the game. It’s about intentionally marking a memory. It’s also about following the game more intentionally. It’s about being fully present to the moment so you can fully cherish the outcome later. I don’t have the perfect scorekeeping style – I’m self conscious of my scorecards in the same way I’m a tiny bit nervous every time I click “Publish” on these blogs. It’s a small piece of myself that can now be found outside of myself. My thoughts are recorded for others to read, react, ridicule and respond. Someone could look at my scorecard and incredulously remark, “Oh, you keep score like THAT?” Weird. It’s true. It’s about more than recording events. It’s about being present to the game and participating in the memory making. This summer, I am committing to keeping score at every baseball game I attend. Especially in light of my new book project, I want to be fully present and attentive. But not only to the game, but to my surroundings as well. Let’s say there’s a streaker part way through the 4th inning of a game. First of all, hilarious, but also it’s a detail that adds to the story overall. Things like that will be marked and remembered. Or let’s say Relish beats out Ketchup and Mustard and wins the hot dog race out at Kauffman Stadium. Depending on the course of the game, that could be the highlight of the evening of me. Better to remember a Relish victory than a home team defeat, in my opinion. You better believe that will be marked and remembered as well. Or even if a fan I’m with hollers something particularly hilarious during the game. I especially look forward to this when I’m in Philadelphia in late June. Phillies fans (and Eagles fans and 76ers fans) are known for being relentlessly brutal to their own teams at times. If there was a contest to see which team’s fans booed their own players most, I guarantee Phillies fans would dominate. I want to remember things like that. Thus, I keep score. One of my favorite moments in games is when there’s a foul ball duel happening between the batter and the pitcher. This pesky hitter keeps fouling off pitch after pitch after pitch; it becomes a head game – mental rock-paper-sissors guessing what pitch is coming next. Moments like this turn into a series of tallies next to an at bat documenting the number of pitches someone has thrown and how epic the stand off became. You don’t notice these face-offs on your smartphone. You remember them by marking them in your scorecard, and in your mind. There is something tactile and connecting about keeping score. It draws us deeper into the game and heightens the memories. The game never draws out and feels boring, and it never passes you by without you noticing. Scorekeeping maintains your presence. It allows you to actively participate in the experience of watching a baseball game. Suddenly you’re not simply being entertained, but you are joining in the proceedings yourself. Maybe it’s not for you. Or maybe you were never taught how. The good news: there’s no wrong way to do it. Whatever works for you is all that matters. ** – A couple interesting notes from the scorecard at the top: Garcia left the game after two innings with an injury which led to a carousel of pitchers and pinch-hitters to deal with. Always an adventure. Also, just looking at the name Suzuki on this card reminds me of these two Cardinals fans sitting next to me who kept making fun of his dramatics behind the plate. and this was the official emergence of Trevor Rosenthal in the 9th inning of this game: K, K, fluke 1B, K. Washington was completely overmatched. Cardinals smoked them 12-4. Next Next post: Directing My Energy: Lord of the Rings, Breaking Bad & S.